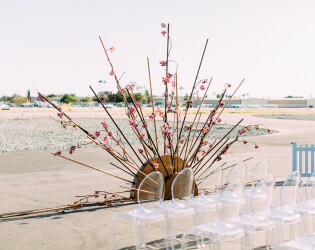 Hangar 21 is one of Southern California’s most unique wedding and event spaces. 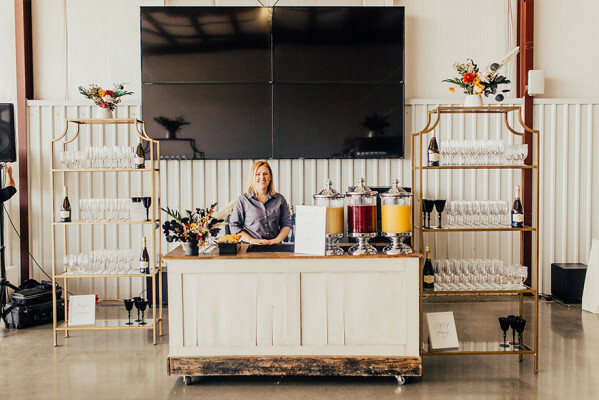 With a large open floor space, accommodations for up to 1200, and versatile indoor and outdoor entertaining options- our hangar provides the ultimate blank canvas designed to let you create the wedding or event you’ve always dreamed of. Impress your guests with a grand entrance in a helicopter- and even a ride of their own! 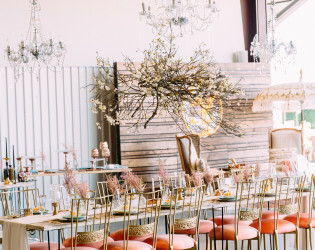 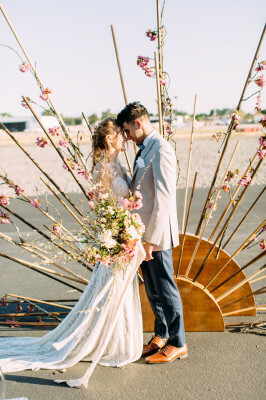 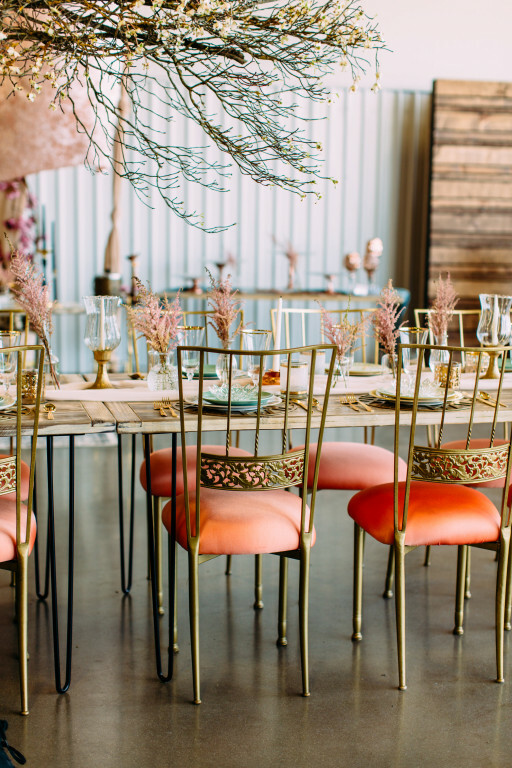 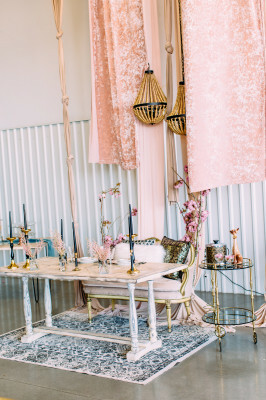 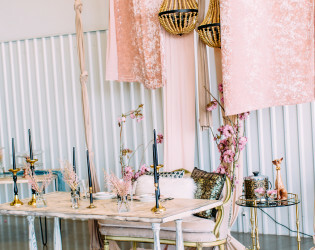 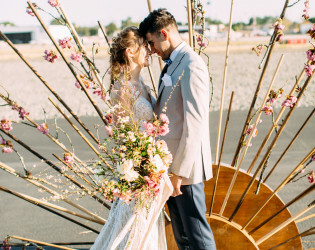 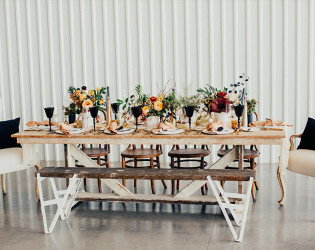 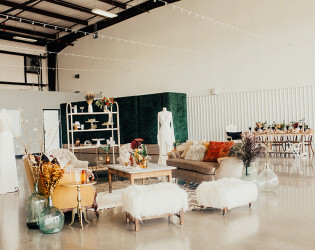 When you book at Hangar 21, you’re not only booking a beautiful venue, but also a unique, one-of-a-kind experience that no other wedding venue in Orange County offers. 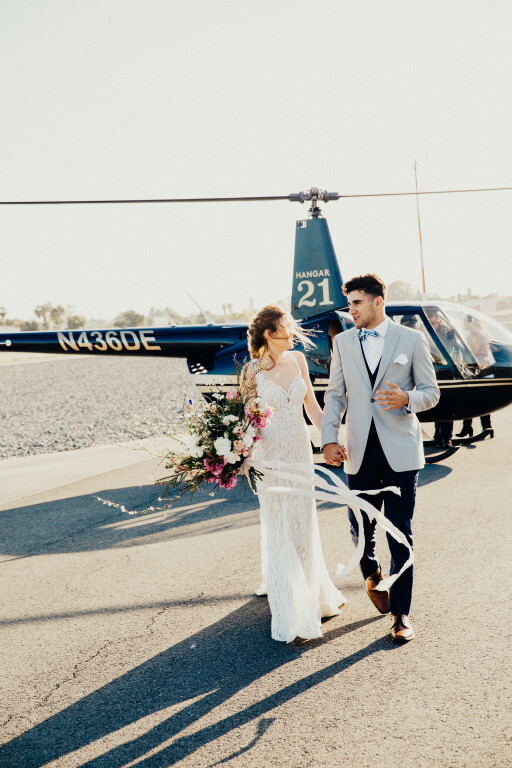 Take flight in our state-of-the-art helicopter and soak in priceless views of Orange County from above including Knott’s Berry Farm, Disneyland, and busy freeway life during traffic hour. 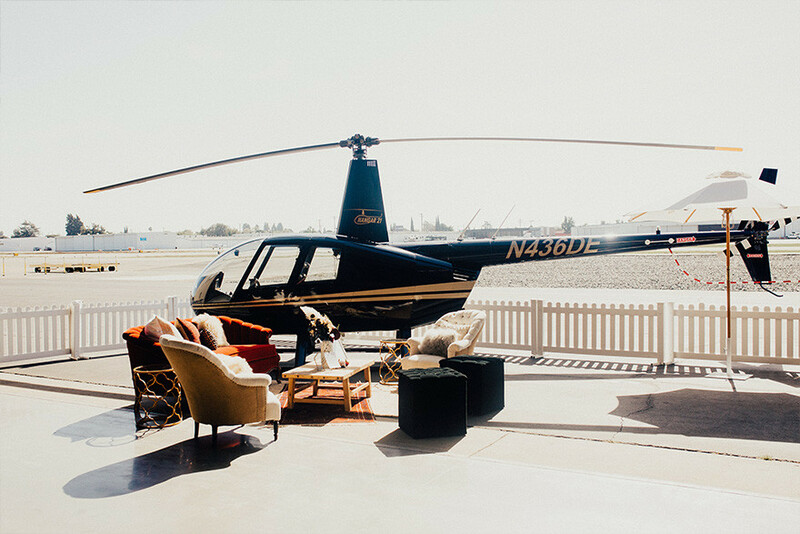 Leave your guests speechless with our helicopter grand entrance, an unforgettable perk of booking the Hangar. 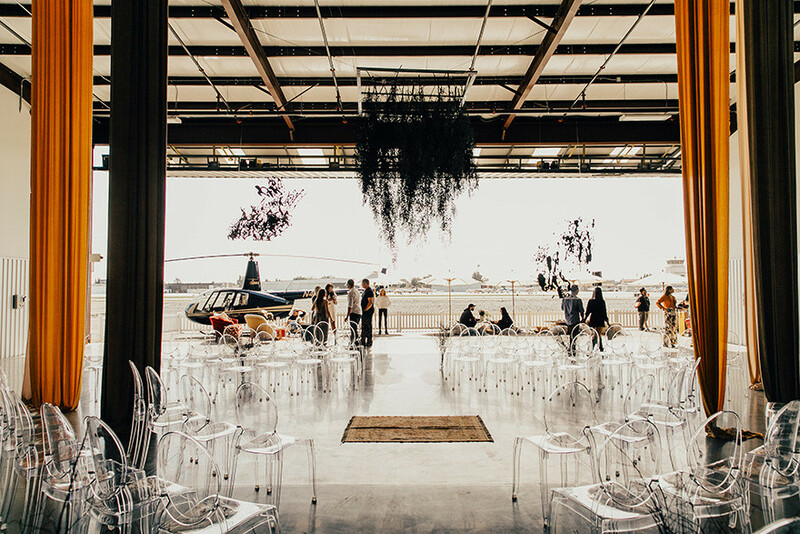 With four helicopter flights included in your venue booking, you can be sure your guests are in for memorable event. Our large open floor space accomodates up to 1200 and provides versatile indoor and outdoor entertaining options. This blank space was designed to let you create the wedding or event you've always dreamed of while leaving a lasting impression on your guests. 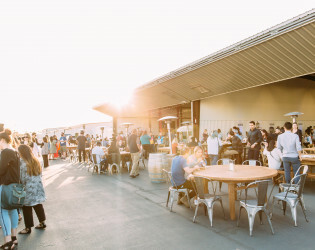 Our property boasts an industrial yet sophisticated and sleek warehouse feel. 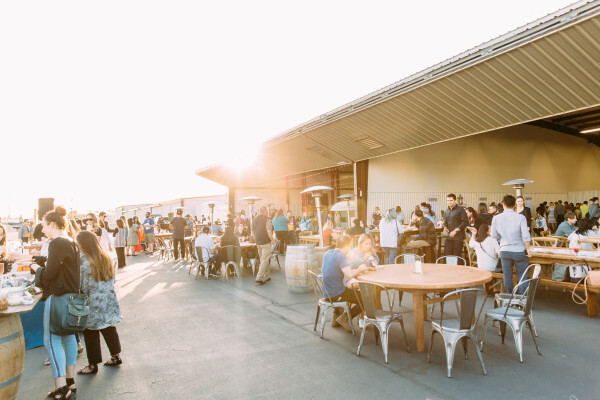 With space that accomodates up to 1200 guests, Hangar 21 is the perfect blank slate for weddings, corporate events, and everything in between. 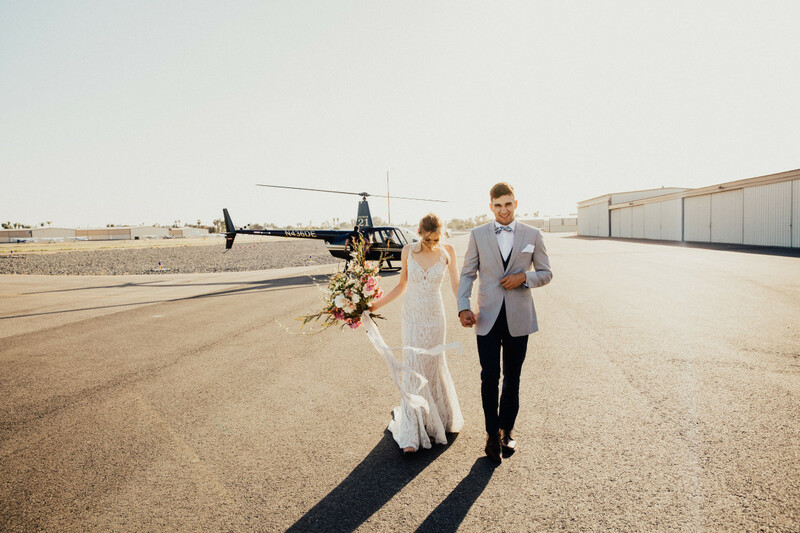 Take flight at sunset in our state of the art helicopter for picturesque golden hour moments. 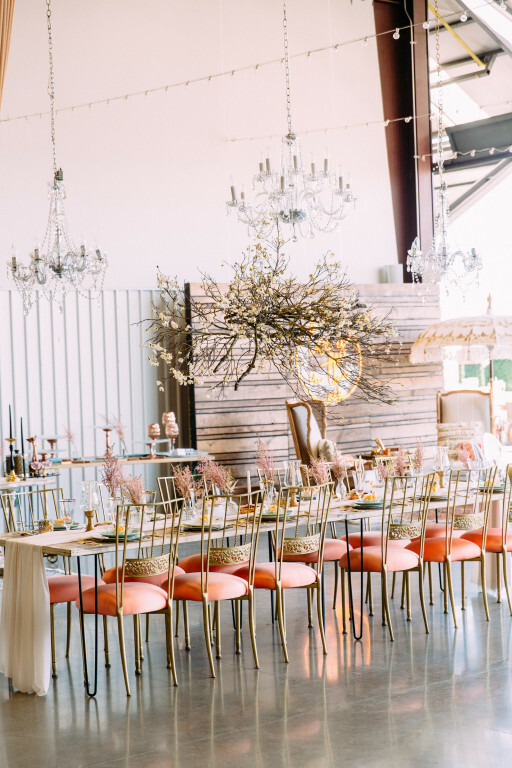 Step into the industrial space of your dreams. 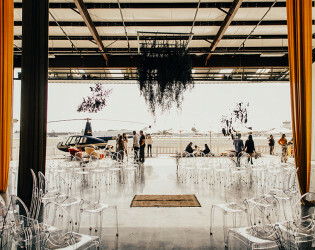 Hangar 21 is one of the most sought after venues in Orange County due to its one-of-a-kind helicopter ride experience, award winning catering, and simplistic, urban design. 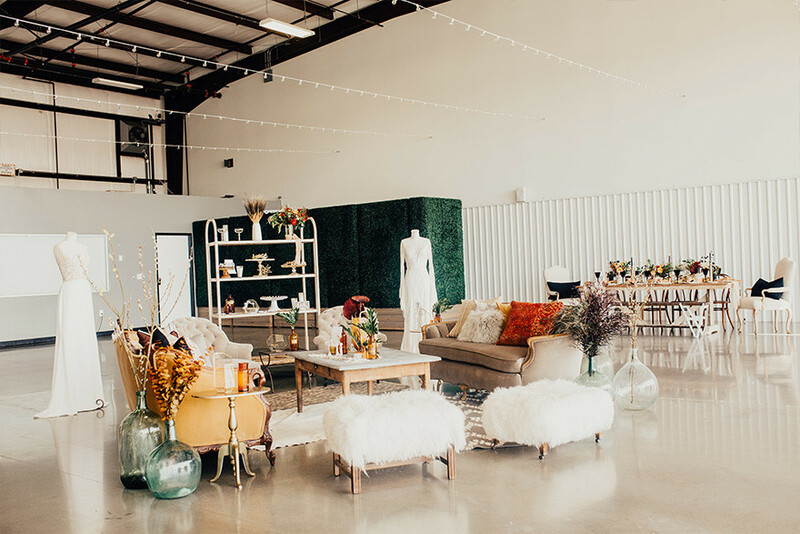 The atmosphere welcomes the outdoors in with large garage doors that open to allow natural light to soak the venue space. 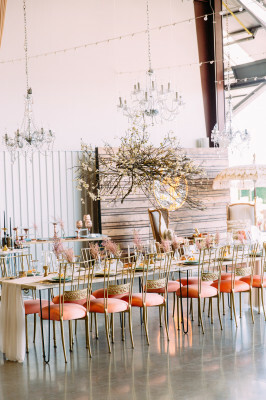 String lights dance across the 25 foot ceiling providing a soft glow in the evenings and our vast and versatile indoor and outdoor spaces offer the ultimate blank canvas to craft a truly unforgettable event. 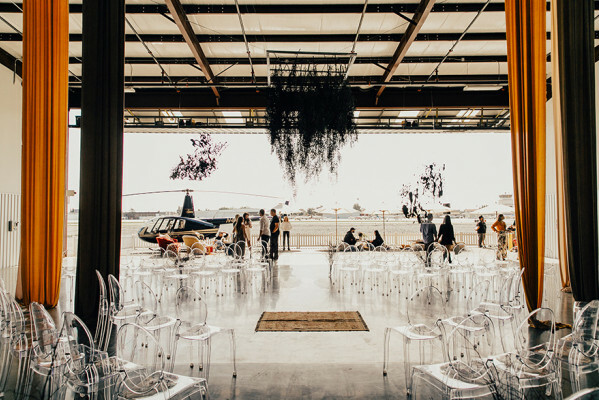 Just by booking Hangar 21, you are guaranteed one grand helicopter entrance plus three additional helicopter flights for up to 9 people; perfect for parents, grandparents, or the bridal party! To really exceed guests’ expectations, give the gift of flight! 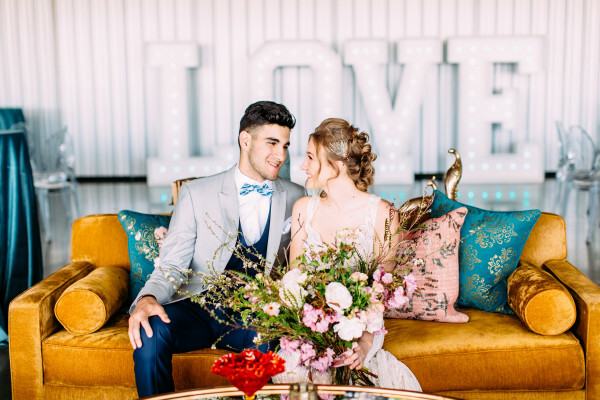 The time of traditional party favors is coming to an end, so spice things up by purchasing helicopter rides for any number of your guests. 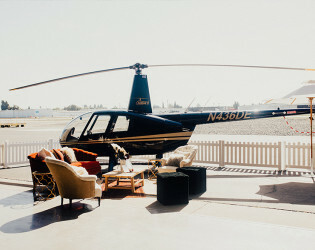 Alternatively, offer your guests the option to purchase a helicopter ride the day of your event at $50 per person. 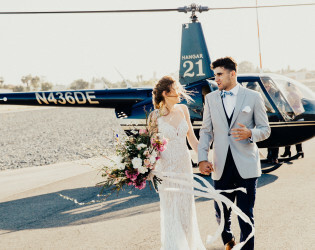 For the early birds, give your guests the opportunity to pre-purchase a helicopter ride on our custom Take Flight webpage. 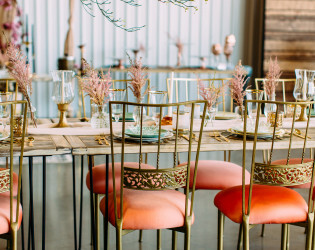 This makes for an exciting addition to your invitations or wedding website. If you’re feeling more adventurous, you can also book our helicopter for destination experiences. Fly to a rugged mountaintop, the middle of the desert, or a private beach on the coast of Catalina for an engagement photo session, pre-ceremony first look, or elopement! 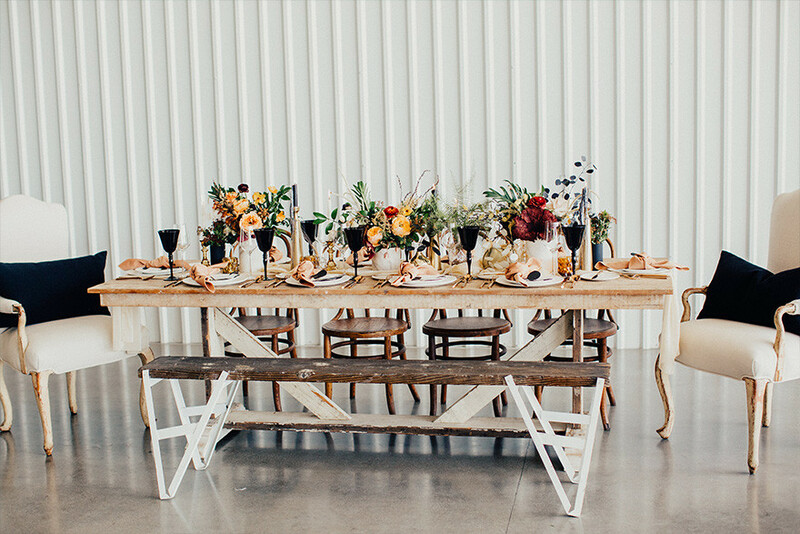 The options are truly endless. 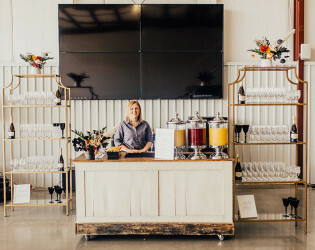 Awards & Notables Named one of the hottest new venues by The Venue Report. 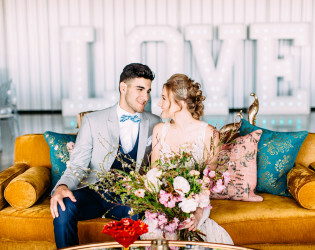 "2019's Hottest New Venue Openings Across The Globe"
Named one of the best outdoor wedding venues by Green Wedding Shoes. 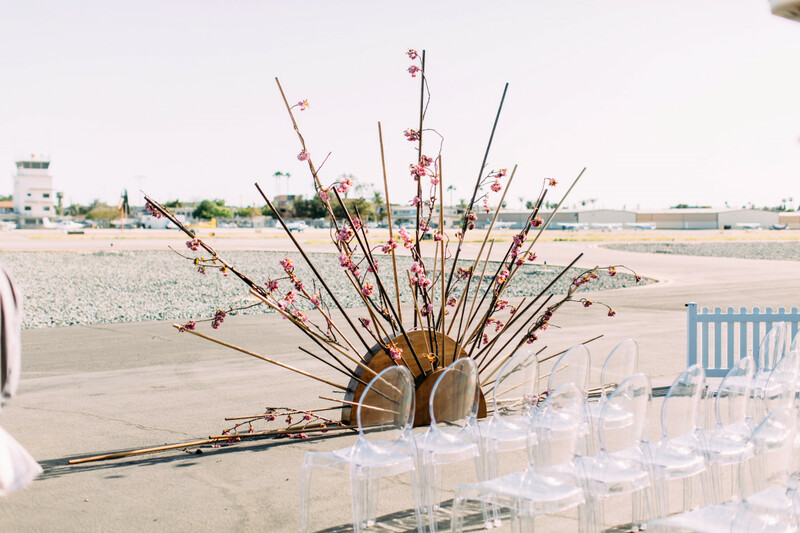 "Definitive List of the Best Outdoor Wedding Venues from Los Angeles to Orange County"